The oil market is wobbling, and that spells good news for private equity firms. That’s according to Ernest & Young’s latest report led by Jeremy Barnes and Charles Berkeley, which surveyed 100 private equity firms around the world. Altogether, private equity firms are sitting on a $971 billion cash pile, citing data from research firm Preqin, and they’re ready to plow money into the oil and gas sector. are eager to jump into the distressed energy credit area. And in the larger scheme of things, these alternative asset managers are beefing up their lending arms as large banks retreat amid intensifying regulatory pressure. The over-supply may be setting up oil prices for another fall, according to David Bianco and the strategy team at Deutsche Bank. Limited access to financing, coupled with reduced cash flow, has triggered a wave of energy bankruptcies in the US. In fact, that number is nearing the size of the telecom bust of 2002 and 2003, and more is likely to come, Reuters reported. That means an increasing debt burden and more creative deal structures for private equity-backed oil and gas companies. 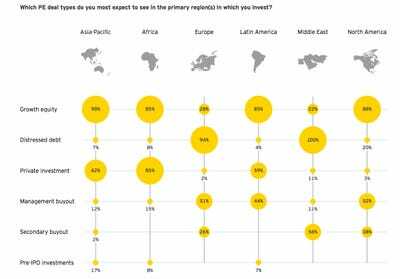 “PE-backed companies are looking to joint ventures to help them cut costs, while others hope contingent pricing will offer much-needed price stability,” said Michael Rogers, EY global deputy private equity leader. One in four surveyees are planning for acquisitions by this year and 43% of them plan to do so by the first half of 2017, according to the report. Among emerging markets, all surveyees said they expect to see more private equity activity in Asia’s growing energy market, thanks to its low cost and ease of doing business and production potential. That is not to say private equity firms are going all in, as most respondents see a persisting valuation gap. 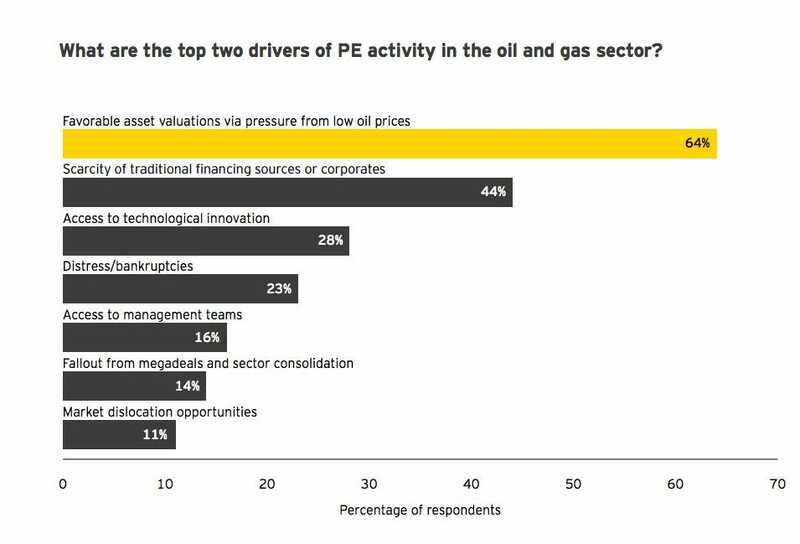 “The valuation from the sell side is higher, which is not acceptable to the buyer as they are linking the valuations to the low price of oil,” a managing partner at a Canadian PE firm told EY. They are also hesitant to invest because of the current market volatility and waiting to see if oil has hit the bottom. We’ve seen crazy swings in oil prices this year, and even the smartest minds on Wall Street have a hard time making sense of it. Steve Schwarzman, co-founder of private-equity giant Blackstone, had said the oil market is making everyone a bozo. Bottom line: private equity firms are going to make a lot of noise in the fortunes of oil and gas early next year.